Winter Park biking gives the rider many options from cycling on the Winter Park paved bike paths connecting 5 different towns with scenic mountain views. 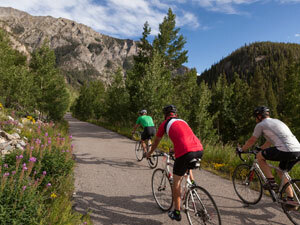 Winter Park mountain biking gives you the thrill of riding on established trails through the mountains of Winter Park. Take a Winter Park guided bike tour or rent a bike from street to mountain bike or get a fat tire bike both in the winter or summer in beautiful Winter Park. Find The Gear You Need For Life's EPIC Adventures!